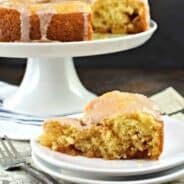 Classic Banana Streusel Coffee Cake with Maple Glaze is the perfect breakfast for your family and friends. Classic Coffee Cake with a banana twist and maple glazed icing! I’ve been cooking up some wonderful breakfast ideas with banana lately. This Classic Coffee cake recipe is what started it all. I don’t even know how to begin describing this cake. It starts with a tender, moist banana cake, topped with a crunchy cinnamon streusel and maple glaze. Who wants a slice? 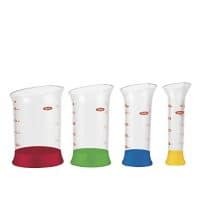 Preheat oven to 350 degrees F. Line two 9-inch round cake pans with parchment paper circle bottoms or spray with non-stick baking spray. Set aside. For the cake, in a large mixing bowl, beat softened butter with sugar for several minutes until combined. Add in eggs and vanilla extract and beat until well blended, Add in mashed bananas. Add flour, baking soda, baking powder, and salt until combined. Beat in skim milk and fold in the nuts (optional). Pour batter evenly into prepared cake pans. For the streusel, combine flour, sugars, cinnamon, softened butter, and walnuts in a small bowl. I use my hands to break up the butter and combine everything. It should form crumbs! Divide topping evenly between the two cakes, sprinkling all over the top. Bake cakes in oven for 25 minutes. Remove and cool on a wire rack for 10 minutes. Remove from pans and cool completely before adding glaze. For the glaze, whisk together the powdered sugar with maple syrup (REAL maple syrup is best) until desired consistency. Drizzle over cakes and store in airtight container. Absolutely. You can freeze it with or without the glaze. Just know that the glaze may look different after freezing. Once you’ve cooled your cake completely, slide it into a large gallon sized, freezer ziploc bag. Remove air and freeze. When ready to enjoy, thaw overnight at room temperature (in bag). The best part of this recipe is that it makes two cakes. Perfect for freezing or sharing with a friend! Whether you like to add the walnuts to this coffee cake recipe is completely optional. I love the nutty flavor and texture the walnuts add, but they can also be easily left out. 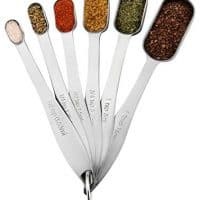 Simply remove them from the recipe and there are no substitutions, continue as written. I think every home should have a recipe box filled with the classics. This banana coffee cake will hopefully one day make it into YOUR recipe box too! Delicious and easy, this Classic Banana Bread Recipe has been in our family for years. It’s the perfect way to start your day and the bread is freezer friendly too! 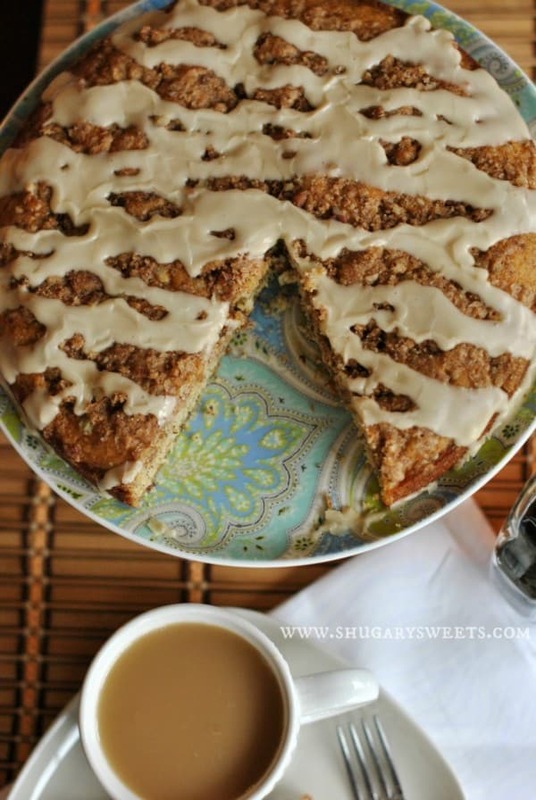 ThisClassic Cinnamon Sour Cream Coffee Cake is a tender cake filled with a cinnamon swirl and topped with a delicious brown sugar streusel. 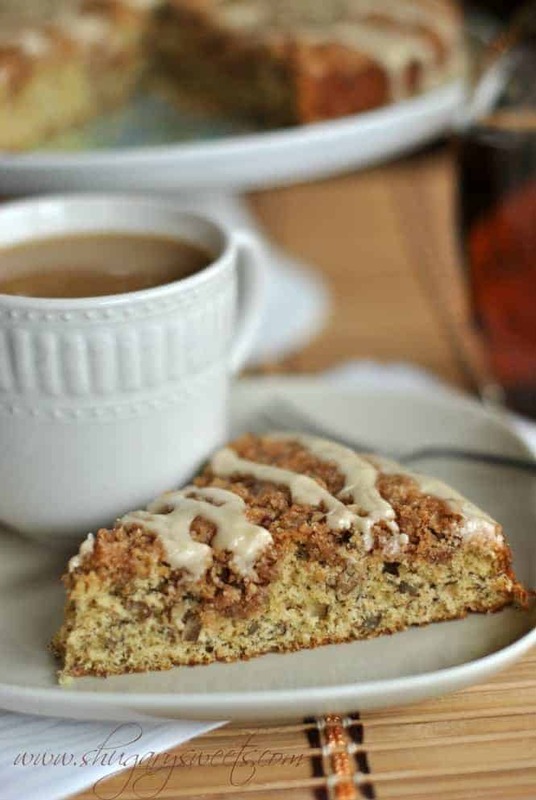 A slice of coffee cake with my hot coffee is one of my favorite ways to start the day. Here are a few of my favorite treats. 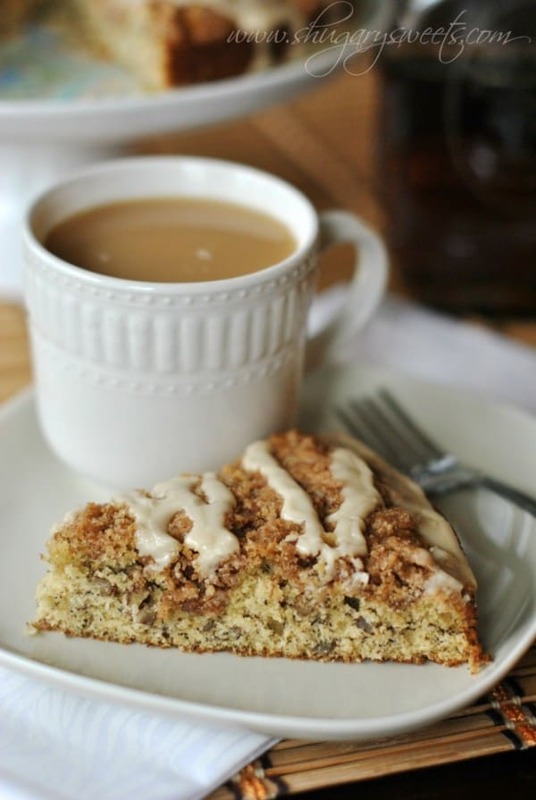 Breakfast just got a whole lot tastier with this Apple Cinnamon Roll Coffee Cake recipe! Easy to assemble, hard to wait for it to finish baking! Looking for a delicious coffee cake to serve friends and family? Or just a great recipe to enjoy on a Saturday morning? This Blueberry Cream Cheese Coffee Cake is your answer! Tender and moist, this Blueberry Buckle Breakfast Cake recipe is the perfect start to your day. Packed with fresh berries and topped with a thick cinnamon streusel, you’ll love a slice for breakfast or dessert! Thick Cream Cheese Coffee Cake has a layer of cheesecake and is topped with a crunchy Cinnamon Streusel. This coffee cake NEEDS to be made for family and friends. I dare you! Banana Streusel Coffee Cake is the perfect breakfast for your family and friends. Classic Coffee Cake with a banana twist and maple glazed icing! For the cakes, beat butter with sugar for 3 minutes. Add eggs and vanilla, beat until combined. Add bananas and beat until mashed (I toss mine in whole, but you can mash them first if you prefer). Add flour, baking soda, baking powder and salt until combined. Beat in nuts and skim milk. Pour batter into two 9-inch round cake pans that have been greased generously. In a small bowl, mix streusel topping ingredients together. I use my hands to break up the butter and mix it with the other ingredients. Mix until it forms crumbs. Divide topping evenly between the two cakes, sprinkling on the top. Bake in a 350 degree oven for 25 minutes. Remove and cool on a wire rack for 10 minutes. Remove from pans and cool on rack completely before adding glaze. For the glaze, beat powdered sugar with maple syrup until desired consistency. Drizzle over cakes. Store in airtight container. **cakes can be stored in airtight container in the freezer. When ready to eat, thaw on counter. ENJOY. Oh yes, I will be making two and keeping both at home. One for me, one for the hubby. I mean, I probably shouldn’t reallllly have my own personal full-size coffee cake, but with that crumbly topping and outrageous glaze, how can I resist?! I love banana everything. I’m baking banana muffins as I type and they smell good! Your recipe looks perfect. Every great coffee cake needs streusel, and the glaze is the icing on the already perfect looking cake! I’m going to have to squeeze this in soon! Mmm this sounds so lovely! A glaze makes the cake, and this one sure looks fantastic! This looks so yummy! I love the topping and the glaze on the top. So pretty! YUM! I could eat the cinnamon streusel and maple glaze with a spoon! These look amazing! Love the streusel topping. I bet these are delicious! how ripe were your bananas? Mushy? I want to make this but I don’t have any and I’m just wondering if I bought new ones if it would work. If your bananas aren’t overripe, you can intensify the banana flavor by roasting them in their skins at 350 for 20 minutes. If you already have overripe bananas, roast them anyway…makes your cake even more delicious! I love a good coffee cake and with bananas…oh, my fave! I always have a craving for banana bread. This is the perfect marriage! I loooove coffee cake Aimee! I am always trying to come up with new versions. Banana and maple is amazing I bet! Bonus, two cakes! Gotta love a recipe that gives. I am happy you didn’t stop with just a banana cake, the topping is to die for! I love this Aimee! I constantly have an excess of ripe bananas hanging around- this would be a great use for them! 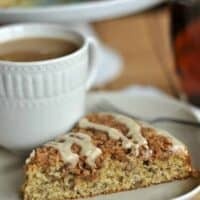 Love the maple and banana combination, especially in a coffee cake! Mmmm bananas and cinnamon make for the perfect breakfast!!! 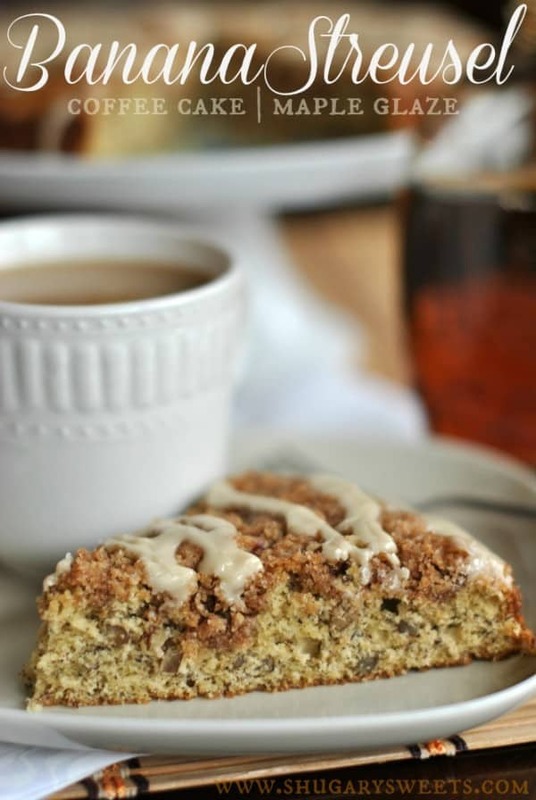 As a huge fan of banana, this coffee cake is calling my name! And that maple glaze sounds heavenly. I love the idea of making two cakes to eat them 🙂 I almost never have bananas ripe enough to use in baking, but boy, this cake sure looks good! I LOVE streusel anything! And with that maple glaze?? It looks soooo good! This is nice alternative to making banana bread, I like the idea of using them in a coffee cake. Good combination with the banana’s and walnuts. This cake looks lovely, but since its a coffee cake I was expecting coffee in the recipe, is this a mistake, or is a US coffe cake something different to a UK one? 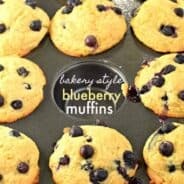 I was looking for something different than banana bread or muffins for my very ripe bananas. So thrilled to have found this recipe! Made it this morning and it is a WINNER! A new family favorite. Thanks so much for sharing! Thanks Carol, it’s a favorite around here too. I appreciate you letting me know how much you enjoyed the recipe! Just made this and wow, so easy and totally delicious. A great way to use up bananas. Thanks! Hi there! Thanks for posting this recipe- just tried it with 3 overripe bananas that I had. Hope they taste as great as they smell!! ENJOY. Hello. 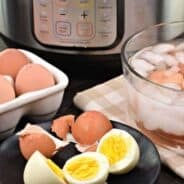 I’m currently making this for about the 10th time and figured I should let you know what a great recipe it is! It’s so forgiving and easy and everyone absolutely loves it. I leave out the nuts (allergy). I also love that it makes 2–one to eat and one to give away or freeze. Perfect! Thanks! Aww, thanks so much for stopping back and letting me know!!! So glad to hear how much you enjoy the recipe!! Hi! Love your blog–I stumbled across it last night when I was trying to think of what to do with my three overripe bananas. I made these two cakes–saved one and brought the other to work. I couldn’t stop eating the one at home! The people at work really raved about it! Awesome recipe! Thanks! Yum! I think I will add this to my Easter brunch! Adding this to my weekend plans! Going to make this for family brunch. These are some amazing flavors!